Osteoarthritis, also known as degenerative joint disease or osteoarthrosis, is the most common form of arthritis. It occurs due to the breakdown of cartilage in joints, which causes the bones to rub against each other. According to Centers for Disease Control and Prevention, about 27 million people in America have osteoarthritis. It usually develops between age 40 and 60. It primarily affects the weight-bearing joints like the knees, hips, spine, feet and back. At times, it may affect the neck and joints in the fingers and hands. Osteoarthritis is more common among women. Additional risk factors include previous joint injuries, weak thigh muscles, jobs that put excessive stress on a particular joint, bone deformities, obesity, genetics, diabetes, and complications of other types of arthritis. Symptoms often develop slowly and worsen over time. Common symptoms include joint pain during or after movement, joint stiffness (especially after waking up in the morning), joints feeling tender to the touch, loss of flexibility, a grating sensation in the joints when they are flexed, and bone spurs around affected joints. If not treated timely, the condition may cause significant disability, leading to knee and hip replacement surgeries. Fortunately, simple lifestyle changes and easy-to-follow home remedies can help you manage the symptoms and lead a pain-free life. 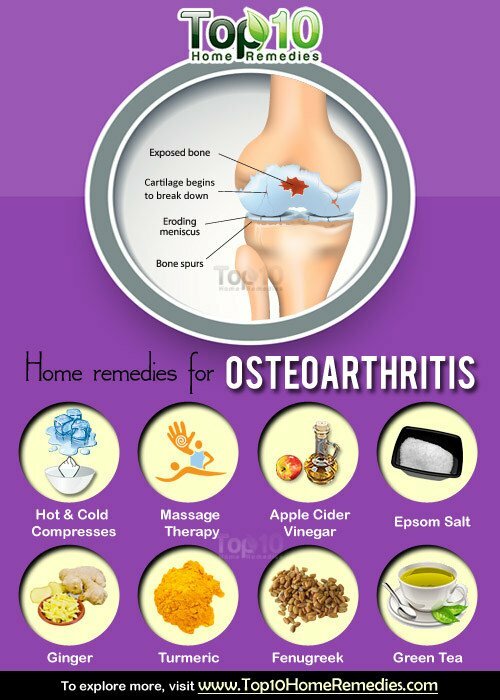 Here are the top 10 home remedies for osteoarthritis. Exercise can help you deal with osteoarthritis symptoms. It will help you increase your endurance and strengthen the muscles around your joints. This in turn will improve mobility. Moreover, exercise will help you lose weight. Try aerobic exercises like walking, biking or swimming for 30 minutes daily 5 times a week. Do gentle weight training and resistance training a few times a week to build stronger muscles. Do range-of-motion exercises at least 30 minutes daily. Avoid high-impact sports, which increase the risk of injury. If needed, get help from an expert to plan an exercise program that is suitable for your health condition and lifestyle. You can use both hot and cold compresses to manage joint pain due to osteoarthritis. While a hot compress will help reduce pain and stiffness, a cold compress will lessen swelling and inflammation. Prepare a hot compress by wrapping a hot water bottle in a thin towel. Make a cold compress by wrapping a few ice cubes in a thin towel. Put the hot compress on the affected joints for 2 to 3 minutes. Replace it with the cold compress and leave that on for about 1 minute. Repeat the process for 15 to 20 minutes a few times daily. Note: Depending upon your condition, you can also use these compresses separately. Regularly massaging the affected areas will help reduce the intensity of pain, swelling and inflammation due to osteoarthritis. In addition, massage improves blood circulation and has a soothing impact on inflamed muscles. Using gentle strokes, massage the affected areas with warm olive oil or coconut oil a few times daily. If massaging worsens the condition, stop doing it. You can also prepare a massage oil with camphor and mustard oil. Add 10 grams of camphor to 1 cup of mustard oil and heat it on low for 5 minutes. Allow it to cool, then use it to massage the affected areas. Another option is to mix equal amounts of wintergreen oil and eucalyptus oil and use it to massage the inflamed joints. As joints become sensitive due to osteoarthritis, be sure to massage gently or go to a professional massage therapist, if necessary. 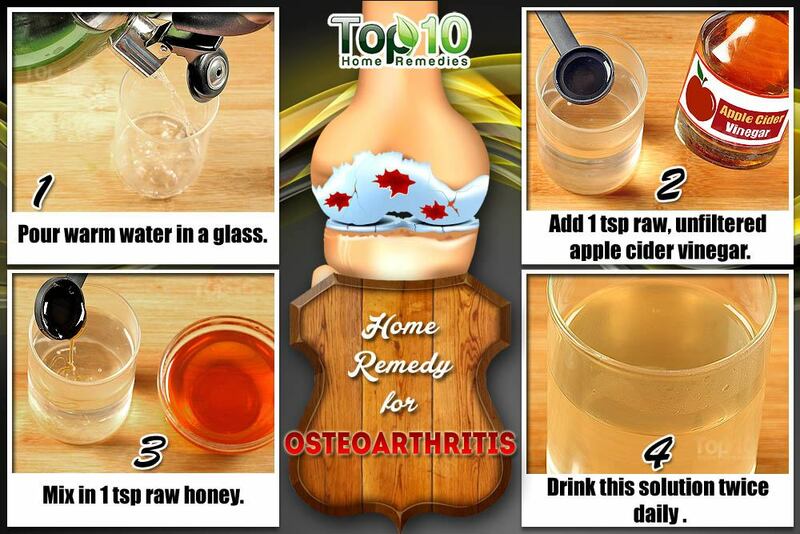 Apple cider vinegar is also effective in the treatment of osteoarthritis. Its anti-inflammatory and alkaline-forming properties help reduce pain and stiffness in the joints. Moreover, it helps get rid of toxins stored in the joints. Mix 1 teaspoon each of raw, unfiltered apple cider vinegar and honey in a glass of warm water. Drink it twice daily, preferably before eating your meal. You can also mix together 1 tablespoon each of organic apple cider vinegar and extra-virgin olive oil. Use it to massage the affected joints a few times daily. 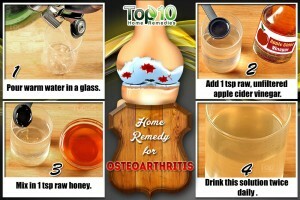 Follow these remedies daily until the pain and inflammation are gone. Another time-honored remedy for osteoarthritis is Epsom salt. Being a good source of magnesium, it helps reduce pain, swelling and inflammation. Add 2 cups of Epsom salt to warm bath water. Repeat 2 or 3 times a week for several weeks or until you get relief from your pain and inflammation. Note: Those who have kidney problems or diabetes must not use this remedy. Ginger is another excellent natural remedy for osteoarthritis. A 2001 study published in the journal Arthritis and Rheumatology found that highly purified ginger extract demonstrated a positive effect in reducing pain in patients with osteoarthritis of the knee. This herb is rich in antioxidant and anti-inflammatory properties that help reduce pain, swelling and inflammation. Moreover, ginger helps block COX-2, a chemical in the body that causes pain. Drink 2 to 3 cups of ginger tea daily. To make the tea, grate a small piece of ginger root and boil it in a cup of water for 10 minutes. Strain and add a little honey. You can even massage the affected areas with ginger oil a few times daily. According to a 2009 study published in the Journal of Alternative and Complementary Medicine, turmeric is an efficacious and safe treatment for osteoarthritis. It may even slow the progression of the disease. 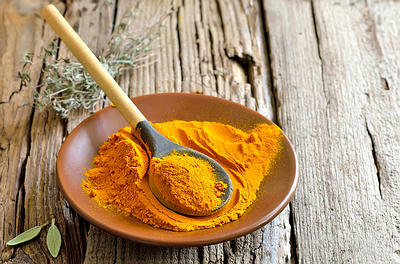 Turmeric has a compound called curcumin that possesses anti-inflammatory and antioxidant properties. Add 1 teaspoon of turmeric powder to a glass of milk and boil it. Add a little honey and drink it twice daily, at least for a few days. Alternatively, take turmeric standardized extract, 300 mg doses 3 times a day, but only after consulting your doctor. Also, include turmeric powder in your daily cooking for additional benefits. Note: Avoid consuming too much turmeric if you take blood-thinning medications or nonsteroidal anti-inflammatory drugs (NSAIDs). Fenugreek is a popular Ayurvedic treatment for osteoarthritis. 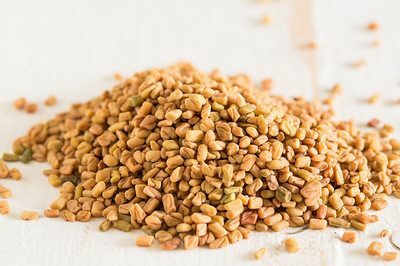 Fenugreek seeds possess antioxidant and anti-inflammatory properties and hence help manage pain and swelling. Moreover, the seeds contain vitamins and essential minerals like calcium, iron and phosphorus that are necessary for healthy bones and tissues. 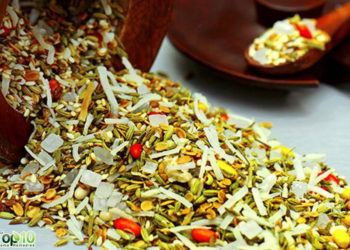 Soak 1 teaspoon of fenugreek seeds in water overnight. The next morning, eat the soaked seeds and discard the water. Do this daily. Alternatively, take 1 teaspoon of fenugreek seed powder along with a glass of warm water 2 or 3 times daily. You can also make a paste of 1 teaspoon of fenugreek seeds with enough water and apply it on the affected areas. Allow it to dry, then rinse it off with warm water. Use this remedy twice daily. Use any of these remedies daily until you are satisfied with the result. According to a 2011 study in Arthritis Research and Therapy, green tea helps prevent as well as control symptoms of osteoarthritis. It has anti-inflammatory and antioxidant properties that help reduce joint pain and swelling. 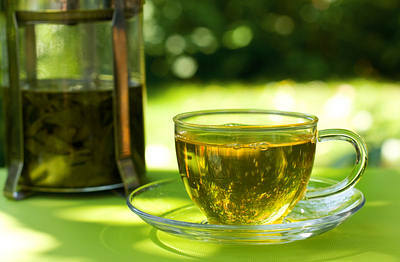 Moreover, green tea helps preserve bone density and maintain bone strength. 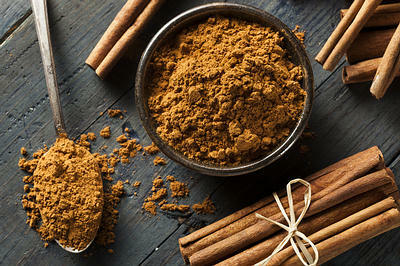 A popular Ayurvedic remedy for osteoarthritis is cinnamon. Known for its anti-inflammatory and antioxidant properties, cinnamon can help fight joint pain and swelling. It will also relax stiff muscles. Mix 1 teaspoon of cinnamon powder and 1 tablespoon of honey in a glass of warm water. Drink it every morning on an empty stomach. Another option is to make a paste of cinnamon powder with a little water. You can also add a little honey. Use it to massage the affected area for a few minutes 2 or 3 times daily. Follow these remedies until your condition improves. Try to sleep well as it helps cope with the pain and stress of osteoarthritis. Use a mixture of avocado and soybean oils to massage the affected areas to control pain and inflammation. Quit smoking and drinking as they may worsen your condition. Meditate to keep your mind off the pain. Try yoga to improve joint flexibility and strengthen muscles. Practice tai chi 2 or 3 times a week to get rid of symptoms. Try splints, braces, canes and other devices that can help ease your discomfort and prevent injury. Stay positive as it can have a huge impact on how you feel and how well you function. Ask your doctor for nutritional supplements that can help manage your symptoms. Expose affected areas to morning sunlight to get vitamin D, which is essential for healthy bones. Include foods rich in vitamins C and E in your diet. These vitamins help keep your bones strong and manage the symptoms. Eat foods high in omega-3 fatty acids like nuts, seeds and cold-water fish to reduce inflammation and pain. If you are overweight, take necessary steps to lose weight. This will reduce pressure on weight-bearing joints and, in turn, lessen pain. You can also try acupuncture to relieve pain and improve mobility. Wow thank you very much ,I’ve learned a lot,keep up the good work. Can you please give us some simple exercises or yoga lessons to reduce knee pain. My Dr told me to lessen my weight, so please give me some yoga lessons or simple exercises to reduce my weight. Thank you so much for all the very informative health tips. I am very grateful to you .